Today we’re going to show you how to make a simple chocolate cake using a pressure cooker. For those who have never tried doing so before, using a pressure cooker rather than an oven is a cool way to make chocolate cake. It’s a relatively unknown kitchen secret and if you make it for others, people will start wondering how you bake such a delicious cake. 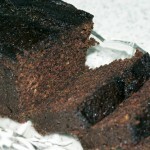 The trick is that the pressure cooker provides an environment to make a moist cake. People started using pressure cookers to make cake because they didn’t have access to an oven. If you’re going to go camping, it’s a good idea to bring a pressure cooker with you rather than a pot because they are much faster to use. The food also comes out more tasty. Here are the ingredients that you’ll need to make the chocolate cake: 1 cup of all-purpose flour, 1/4 cup of cocoa powder, 1 tablespoon of baking powder, 1/4 cup of melted butter, 3/4 cup of powdered sugar, 1/4 cup of water, 2 eggs, 1/2 tablespoon of vanilla extract, a pinch of salt, 1 cup of cream, and 1 cup of chopped chocolate (you can use whatever kind you like). First you’re going to mix everything together. Start with the dry ingredients. Sift the flour, cocoa powder, baking soda, and salt into a bowl. Then beat in the eggs, sugar, vanilla, water, and butter. Mix everything well. Pour the batter into a greased pan and steam in the pressure cooker for 30 minutes without weight. According to the leading pressure cooker review site Cook With Pressure, the best pressure cooker for making cake is the electric pressure cooker Secura 6 quart pot. While the cake is steaming, begin preparing the ganache. Place a bowl over a pot of boiling water. Put the cream inside the bowl and heat through. Chop the chocolate into chucks and place it in another bowl. Pour the hot cream over the chocolate and mix until silky smooth. You can add a piece of butter into the mixture to give it a shiny consistency (optional). When the cake is done steaming, take it out and let it cool for 15 minutes. Then pour the ganache over the cake and let it cool inside the fridge before serving. You can serve it with ice cream or fresh fruit too. You can read the full Secura 6 quart pot review to see how well it is rated. We have gone through many, many reviews and found that using an electric pressure cooker is a better choice than a regular pressure cooker, even though both will do the job.